@EddySteady, Joe Rogan has a stnd up bit on this. It will put you in tears. @EddySteady, Tell me more about this "immoral family" - specifically, are any of them hot women? That's not a moral voice, that's a retard voice. If you genuinely believe eating meat is equivalent to homicide from a moral standpoint, please kill yourself. The human race's chances for long term survival will measurably go up without you. 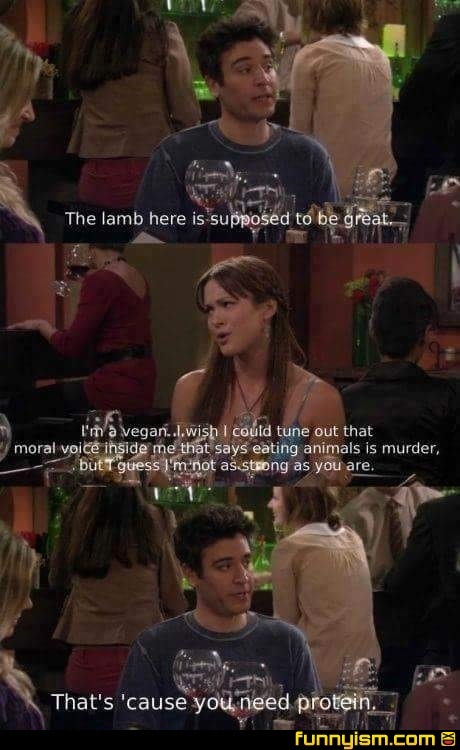 @I Are Lebo, Friend of mine was vegetarian for years because she thought it was wrong to kill animals. Then one day she just woke up, realised she didn't really give a sh*t and started eating meat. She's awesome. Weird, but awesome. @hey cool Lars, not the same thing, nor is it the same point. Killing an animal for food isn't the same thing as buying a steak from a store and eating it. That was my point. If someone has a warped sense of perspective and thinks that putting a cow through a slaughterhouse isn't any different than putting a human through one, that's one thing. But a lot of vegans equate the act of eating meat with the act of killing, and the two are not the same. A single cow makes many, many meals, because we use every part of the animal. The cow in question also only exists because it was bred by humans for the purpose of producing food. Yeah, Western society eats way too much meat. But it's not an ethical problem, it's a health and environmental problem. @Nellybert , killing each other for food is literally how nature works. @I Are Lebo, Yeah, pretty much. @GeekGirl, I think it's more about what happens when you are totally removed from nature. Do you have any idea how many Americans think that grocery stores create what they sell? How many people who never stop to think or realize that packaged meat was once a part of a living animal? I lived on a meat farm for two years. Everyone there went vegetarian, at least temporarily, except for me. I have no issue with feeding an animal one week and eating it the next. It's natural. What's not natural is thinking that processed food is the only type of food. My sister's friend is the rare good kind of vegan. She is very careful to follow the vegan rules for her own consumption, clothing, etc., but does not try to impose her lifestyle on others, even at meals. Honestly, being around her was similar to a picky eater (like me)- "enjoy your meal your way, let me eat my way." I just appreciate food. Animals eat animals, animals eat eggs. I see no reason against any of it. Except Lasagna, I have been made to hate lasagna.